Barring something truly unforeseen, the Global Sprint Challenge will go unclaimed for another year. What's that? You're not aware of the Global Sprint Challenge? That's a shame but not a surprise, especially if you live in North America, which is not represented in the series. For the record, the GSC offers a US$1 million bonus to the connections of any horse that can win three legs of the 10-race series. The catch is, those victories have to come in three different racing jurisdictions. Since three of the races are in England and two in Australia, it takes some planning to get the brass ring. It used to be even harder. Until the rules were changed a few years ago, races in a horse's home jurisdiction didn't count. Despite the slight easing of conditions -- and despite the brilliance of globetrotting sprinters like Lucky Nine, Lord Kanaloa, Black Caviar and Slade Power -- the prize remains unclaimed. It could have been within reach this year for Lucky Nine, the Hong Kong-based sprinter who won the fourth leg of the series, the 1 KrisFlyer Sprint (Sing-I) at Kranji in Singapore on May 18. Trainer Caspar Fownes had planned to take Lucky Nine to Japan for the Sprinters Stakes (Jpn-I) on Oct. 5, then return home for the 1 Longines Hong Kong Sprint (HK-I) on Dec. 14. That plan came a cropper when Fownes frowned on the quarantine facilities at Niigata, where the Sprinters Stakes is being run this year while the regular site, Nakayama, is undergoing renovation. While praising the Japan Racing Association for its spirit of cooperation, Fownes said he had been unable to secure suitable stabling for his star. Lacking a "Plan B," he told the South China Morning Post, "We'll just have to stay home and concentrate on having the old boy perfect for December here at Sha Tin." Slade Power won two of the three British legs of the series -- the Diamond Jubilee (Eng-I) at Royal Ascot on June 21 and the Darley July Cup (Eng-I) at Newmarket On July 12. Of course, only one counts toward the GSC's three wins. Trainer Eddie Lynam said the 5-year-old is headed for the Darley Classic (Aus-I) at Flemington on Nov. 5 but, rather than going for the hat trick in Hong Kong, currently is headed for the breeding shed after the Australian race. Sole Power won the King's Stand (Eng-I) at Royal Ascot on June 17 and, while a 5-furlong specialist, did finish second to the great Lord Kanaloa in last December's Longines Hong Kong Sprint (HK-I) -- albeit 5-lengths second. He looks unlikely for the last two stops on this year's GSC tour. First, there's the schedule and the choice of venues. The series opens in mid-February in Flemington -- not a location likely to attract many top international runners, especially when Black Caviar was lurking there for the past few years. This year's winner is named Snitzerland. The second leg was the Dubai Golden Shaheen (UAE-I) at Meydan. The third was just one day later -- the Group 1 Takamatsunomiya Kinen (Jpn-I) at Chukyo in Japan. Cross off the February race Down Under and pick one from the late March races. Win one of those, then travel to England and win any one of three legs there. But remember, only one leg per jurisdiction counts for the bonus. And there are plenty of other choice sprint targets in the UK, including a third to be added next year at Royal Ascot. Then it's on to Japan? Australia? Hong Kong? Clearly, it COULD be done if the prize were seen worth the effort and risk. Black Caviar, for example, won the Lightning and the Diamond Jubilee in 2012 but, after the torturous trip to England, wasn't about to risk her unbeaten record by traveling again. That was a no-brainer. "Much like the American Triple Crown, this is not intended to be easy but rather it is recognition of great achievement at the highest level," said Bill Nader, Executive Director of Racing for the Hong Kong Jockey Club. "It will most certainly continue in 2015 and add to the residual value of any horse able to win it." And Leigh Jordan, speaking on behalf of the series, argued it already has been a success in terms of horses traveling internationally, even if the prize has yet to be claimed. "This year in Australia, we will see Europe's champion 1,200-meter horse, Slade Power, running at Flemington," Jordan noted. "Over 50 horses trained outside Europe have run at Royal Ascot since the challenge began in 2005. "It has never been structured as a formal competition -- more an industry-focused promotional tool -- although we would expect the bonus to be won sooner or later and that would no doubt focus some more mainstream attention on the challenge," Jordan said. It's obvious the US$1 million bonus -- $750,000 to the owner, $250,000 to the trainer -- isn't motivating participation, even with the offer of "contributions toward the cost of transport" for runners. More money would help. Some jurisdictions have experimented with a supplemental bonus for their sprints. Or, is Longines tapped out? It would be nice, too, to have an American race in the mix. But the logical candidate, the Breeders' Cup Turf Sprint, would conflict with the Darley Classic. Anyway, it would be unrealistic to expect Breeders' Cup to surrender any autonomy to an international agreement. Mid-August is an open date in the GSC schedule and a turf sprint added to Arlington Park's International Festival of Racing would be a good fit. But Illinois racing is in such dire straits that any expansion appears impossible. Jordan said the GSC is, in fact, in negotiations with potential sponsors and has had applications from other nations to join, "all of which is very positive for the future and all of which we are considering." That's encouraging. 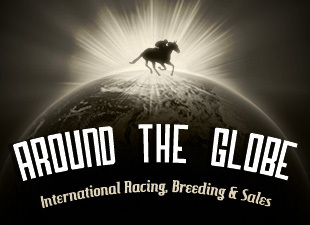 International competition clearly is the cream of Thoroughbred racing and, if promoted properly and supported more generously, might stir up a lot more general interest for the sport -- interest that could be channeled down to more involvement in day-to-day racing.